Marcus Maddison's talents should be better appreciated. League One takes a break for FA Cup action this weekend so it’s the perfect time for Peterborough Telegraph Posh writer Alan Swann to reflect on Peterborough United’s season so far. Does he believe Posh can retain their place in the play-off positions, or even climb higher? Read on . . .
Posh need goals from Lee Angol. There are Posh fans who don’t accept players with maverick tendencies. It happened with Lee Tomlin and it’s happening again with Marcus Maddison. Both have attracted abuse on social media from angry keyboard warriors. Tomlin is a better player than Maddison, but as the current squad lack individuals with obvious goalscoring potential, abusing the most creative force seems rather bizarre. I suspect Maddison is a player who reacts better to love than hate. The knockers need to get off his back and accept his multiple assists and decent goalscoring ratio outweigh his lack of heading ability/defensive skill. Posh centre-back Ryan Tafazolli was a decent summer signing. The stats confirm his worth to the side. He’s the joint-top scorer with six goals and is well out on his own in terms of goal assists with eight, twice the number of any other Posh player, and the most in the division alongside John Fleck of Sheffield United. Maddison will be a key man in a promotion push. His foibles should be indulged. How’s manager Grant McCann performed in his 19 games? Pretty well I would say for a rookie boss who inherited other managers’ players. Posh chairman Darragh MacAnthony (left) with former first-team manager Dave Robertson. McCann would probably change some of the mid-game substitutions he made early in the season and he placed too much faith in teenage striker Deon Moore, but he has been pleasingly consistent with his team selection and impressively ruthless with those he doesn’t rate (Williams, Santos, Nabi) as highly as others. But the manager has also been open-minded hence Shaquile Coulthirst’s rehabilitation six weeks after Posh had tried to show him the door. Having an obvious commitment to Posh doesn’t always mean a lot (Dave Robertson anyone?) but in this case it’s quite warming. I am confident McCann has the ability to turn Posh into a promotion-winning team, with help from the chairman obviously. I am not certain it will happen this season though. Gwion Edwards is too good a player to be on the Posh substitutes' bench. Beating Northampton twice has ensured his honeymoon period within the fan base will extend well into the New Year. The January transfer window will again be key for Posh. If they want promotion they must not sell Chris Forrester or Maddison. If they want to/need to cash in on a player it should be young Leo Da Silva Lopes. His departure could be covered by those already in the squad, especially if Brad Inman is as good as Posh expect him to be. If they want promotion they must sign two strikers capable of scoring double-figure goals in the second half of the season - it’s optimistic to think a St Albans’ striker will be the answer. The glaring weakness in the Posh squad is obvious - they lack goalscorers. Their top scorer in League One matches is Maddison with just six goals. Even with the improvement in the Posh defence that isn’t good enough for a promotion team. I admire Coulthirst’s attitude and Tom Nichols’ movement, but they have been found wanting in the most important part of their role - scoring goals. Lee Angol could be the answer, but he’s still finding his feet after injury. McCann and his management team have shown a good eye for a defensive player. Goalkeeper Luke McGee, centre-back Ryan Tafazolli and left-back Andrew Hughes have enjoyed good seasons so far having been recruited by McCann and his team. Only four teams have a better defensive record in League One than Posh. When Posh have scored the first goal in League One matches this season they have never lost (five wins, two draws) which suggests they have good defensive strength and organisation. McGee’s loan must be extended in January. That will be key to any success. Last season’s threat from Darragh MacAnthony suggesting he will seek new owners next summer if promotion isn’t achieved should concentrate minds on securing promotion. Posh don’t need new owners. Posh enjoyed some success playing 4-2-3-1 earlier in the season and I wouldn’t be surprised to see that formation return soon if the strikers remain goal-shy. The above formation would help get the best players on the pitch more often. Gwion Edwards is too good to sit on the substitutes’ bench. McCann is clearly a huge fan of the midfield diamond and it has been successful, but Michael Bostwick’s position in the side needs to be flexible. Against direct teams like Bolton and Northampton he is the best man for the role at the base of the midfield diamond. 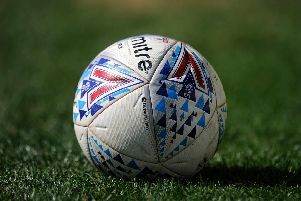 But in games when Posh can expect On the evidence of last week at the ABAX Stadium, Scunthorpe’s organisation and work ethic has been enough to make them strong automatic promotion contenders. They are a slightly more attractive version of Burton Albion. I can’t see Sheffield United, Bolton, Bradford City or Charlton failing to reach the play-offs which leaves one spot for Posh to fight for. Posh lost narrowly at Sheffield and beat Bolton rather comfortably so a play-off spot shouldn’t be ruled out just yet. to dominate possession it might be best to return Chris Forrester to that position where his superior passing ability would be more important. Forrester’s form dipped when he was shifted into a more advanced role. 8 - MARCUS MADDISON (Posh), John Fleck (Sheffield United). 6 - Simon Cox (Southend). 5 - Matthew Taylor (Northampton), Josh Morris (Scunthorpe). 4 - 15 players including TOM NICHOLS (Posh). Posh have the 14th-best average home gate of 5,480.